This web page section shows observations of asteroid "2004 MN4" that have been calibrated using Tycho stars in the same images used for observing the asteroid (71 x 47 'arc). All-sky photometry was attempted on several occasions but the atmospheric extinction was too variable due to scattering from cirrus clouds. I conclude that this asteroid is ~0.3 magnitude brighter than the ephemeris value of H = 19.3, i.e., I suggest that H = 19.0. Details are given below. Figure 1. Plot of V-equivalent magnitudes for asteroid "20044 MN4" based on Tycho stars in the same image as the asteroid. No adjustments have been made to achieve a fit to the model curve, which is based on the analysis of Dr. Raoul Behrend. The period for this plot is 1.250 days instead of Behrend's 1.2764 days. The green symbol was made using a V-filter, the others were unfiltered. Changes in apparent brightness due to changing distance from Earth have been removed in a way that renders the plot valid for January 16. A known instrumental sensitivity to star color has been applied to the asteroid using an assumed B-V = 0.80.
where Fv = flux (using a V-filter), g = exposure time [seconds], Kv = zenith extinction (using a V-filter) [mag/air mass], and m = air mass. On photometric nights Kv = 0.12 [mag/air mass]. On non-photometric nights it is higher, and must be established using either Tycho stars or nearby Landolt stars. For these observations Tycho stars were used for calibration, and they don't have reliable B-V colors, so I assumed they were typical in having B-V = 0.64 (the average of all 1259 Landolt stars). The asteroid is assumed to be redder than typical stars, with B-V = 0.80 +/- 0.05 (as suggested by Prof. Richard Binzel). One V-filter observation confirms the unfiltered results taken a few minutes earlier. The ephemeris currently uses H = 19.3. The magnitudes in the above plot were adjusted to be valid for January 16, when the ephemeris predicts a V-magnitude of 17.53. The asteroid appears to be brighter by 0.33 magnitude, implying that H = 18.97. The uncertainty on this suggested value for H depends upon the validity of G. But for now, let us adopt the ephemeris value of G = 0.15. Tthe main uncertainty would then come from the measurements presented here. The assumed B-V for the asteroid produces an uncertainty of only 0.004 magnitude (i.e., assuming B-V = 0.80 +/- 0.05). Another source of uncertainty is the use of Tycho stars with unknown B-V. Since different Tycho stars were used for each observation night, and since an average of 3 such stars were averaged, it can be estiamted that the average of 4 observing nights (12 Tycho stars) introduces an uncertainty of ~ 0.03 magnitude for the average magnitude of 17.20 (this is based on an estiamted RMS on B-V for Tycho stars ~ 0.3 magnitude and a star color sensitivity of 0.30). This is probably the principal systematic error source for the observations reported here. Another source of uncertainty relates to the way I used a model rotational light curve for fitting the observations. If, for example, all observations were at the peak brightness part of such a light curve then it is obvious that the asteroid's average brightness would be over-estimated. However, in this case most of the measurements were made during the rising portion of the light curve. I estimate that this source of uncertainty is ~0.05 magnitude. Finally, stochastic uncertainty ("noise") is present, but with SNR typically > 50 for each data group shown in the above plot this source of uncertainty is estiamted to be < 0.02 magnitude. I conclude by suggesting that the value for H be revised from 19.3 to 19.0 +/- 0.10, subject to the assumption that G = 0.15. Near Earth Object asteroid "2004 MN4" was discovered last June, was lost, then was recovered in November. 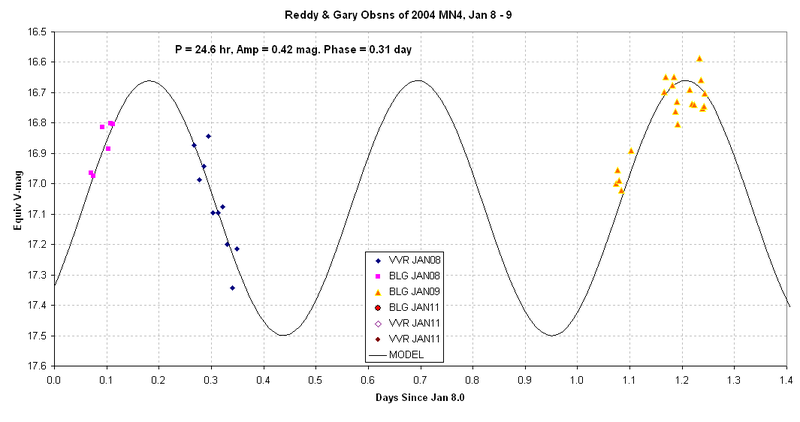 By December 23 the orbit had been established well enough by NASA's Near Earth Object Program Office at JPL that the NEO Program Office (Yeomans, Chesly and Choda) posted at MPML that a near Earth pass in 2029, April 13 had a 1 in 300 chance of Earth impact. Because of the December 27 re-assessment of a 1 in 37 chance of Earth impact in 2029 an effort was made to refine the orbit with new astrometry observations. Finally, the Spacewatch telescope at Kitt Peak found an image of the asteroid (mag 22) taken in March (before the discovery) showing an asteroid position that was quickly incorporated into orbit calculations that reduced the probability of Earth impact to near zero. Nevertheless, the pass in 2029 will occur, and the asteroid may pass close enough (8 Earth radii) to be visible with the naked eye. There has been considerable discussion on the MPML about photometry shortcomings, and the need for better brightness values in order to estimate asteroid size. Radar observations are planned, and part of the planning requires approximate maximum Doppler width from the returned echo. Therefore, to assist in radar planning it is important to obtain brightness measurements that are not only accurate but precise enough to establish a rotation period. 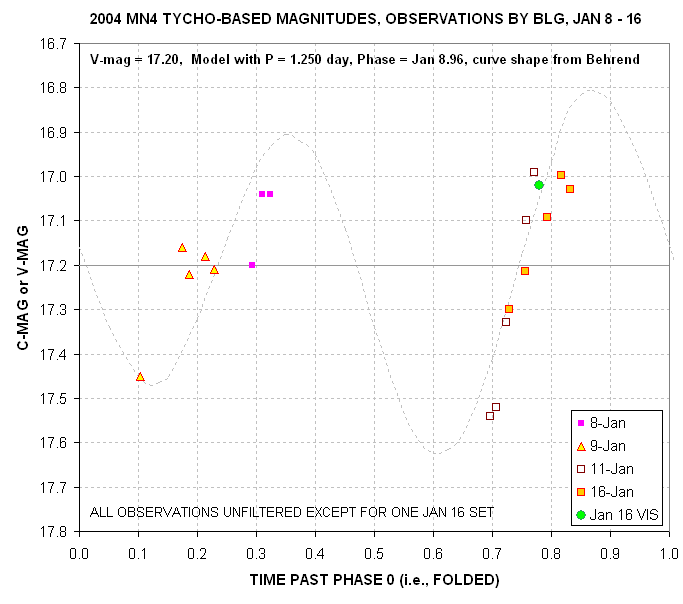 On January 6 Raoul Behrend reported to the MPML that Yassine Damerdji had obtained observations at Haute-Provence Observatory from which a rotation light curve was derived. The light curve solution (by Damerdji et al) calls for a period of 0.6 +/- 0.4 day (14.4 +/- 9.6 hours) and an amplitude of 0.2 mag (half of peak-to-peak variation). 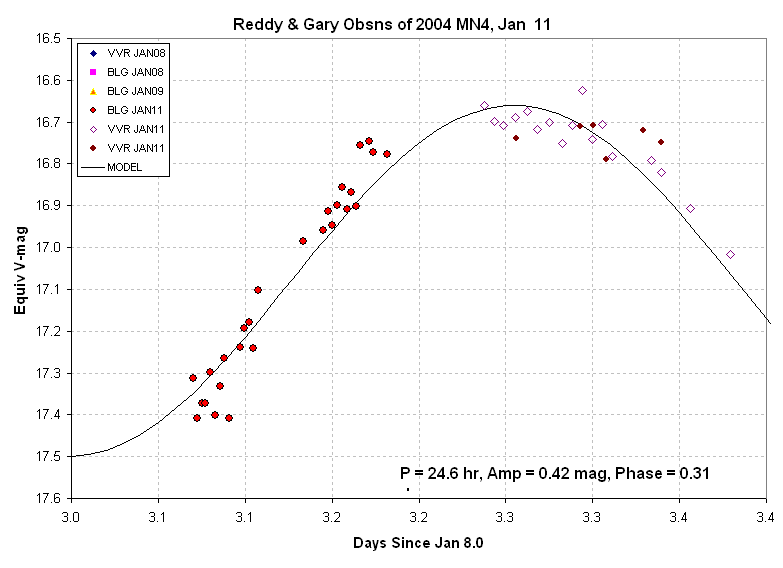 The light curve can be found at http://obswww.unige.ch/~behrend/page5cou.html#04m04n. On UT dates January 8, 9 and 11 Vishnu V. Reddy (University of North Dakota graduate student) and Ken Archer (Ironwood Observatory, Hawaii) used the 10-inch Takahashi Baker-RC f/5 telesope and SBIG ST8 CCD of the Ironwood Observatory, Hawaii (F60) to observe 2004 MN4. These observations were conducted remotely from North Dakota by VVR using the Share My Sky program. On January 8, 9 and 11 Bruce Gary observed "MN4" using the Hereford Arizona Observatory (G95) Celestron 14-inch SCT and SBIG ST-8XE CCD. The January 9 and 11 observations were made through cirrus clouds with extinction variations of 0.6 magnitude. Our data have been combined and are shown in the following figure. Figure 1. Equivalent V-magnitudes (from unfiltered observations) during a 4-day observing interval. The magnitude scale is set by a January 11 image (by BLG) with several Tycho stars in the same FOV as the asteroid. All other data sets were zero-shifted to agree with the BLG Jan 11 data. The BLG observations (at Hereford Arizona Observatory, G95) were made by Bruce L. Gary with a 14-inch Celestron and SBIG ST-8XE CCD, and were processed by median combining sets of three 60-second exposures using the asteroid for alignment. The VVR observations (at Ironwood Observatory, Hawaii, F60) are 5-point averages of 60-second exposures. Figure 2. 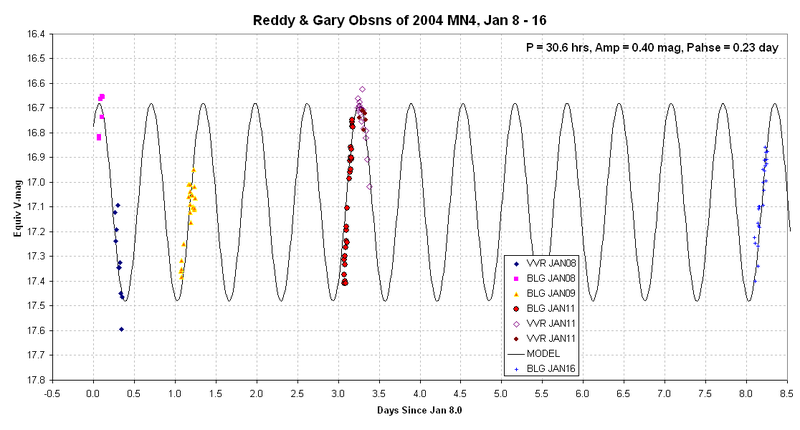 Same as previous figure except showing only the Jan 8 and 9 observations. Figure 3. 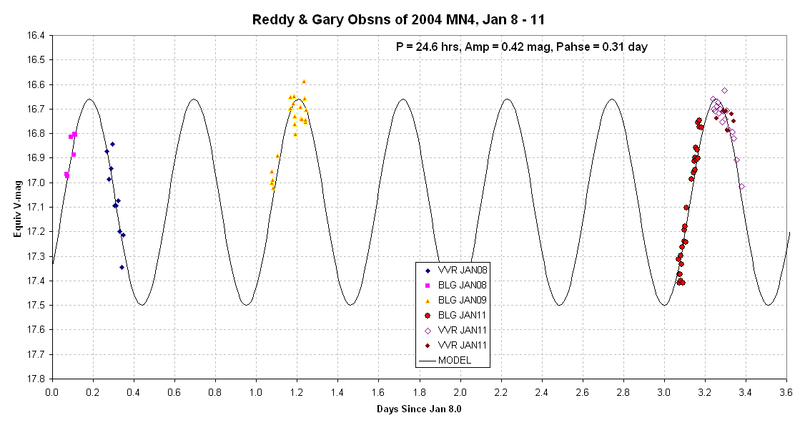 Same as first figure except showing only the Jan 11 observations. The fitted sinusoidal model solution has two periods per rotation period. The rotation period from this data (alone) is estimated to be ~24.6 hours. The amplitude (half of peak-to-peak) is 0.42 magnitude. I hesitate to give SE uncertainties since I've been wrong about this several times in the past week. Note that using a sinusoid is just a first approximation for fitting an asteroid rotation light curve. Shape matters, and all real asteroid shapes produce light curve shapes that depart from sinusoidal. The procedure used by BLG for reducing images to asteroid magnitudes involves two analysis phases. The first phase transfers magnitudes from Tycho stars in the FOV to secondary stars near the asteroid's path. The second phase uses these secondary calibration stars to determine the magnitude of the asteroid in sets of 3 median combined images. The first phase consists of the following: calibrate raw images (dark and flat), median combine neighbor sets of 3 images using stars for alignment (MCs images), median combine the same 3 images using the asteroid for alignment (MCa images), read intensity of MCs Tycho stars for several images, determine extinction and zero-shift parameter in a spreadsheet, use these extinction and zero-shift values to determine magnitude of stars near the asteroid's path, adopt the average magnitude for these secondary calibration stars for use as reference stars. The second phase consists of the following: perofrm two median combines for each set of 3 images, one aligned using the asteroid and the other aligned using the stars. Intensity readings are made of the (three) secondary reference stars on the MCs images, and intensity readings are made of the asteroid on the MCa iamges (placing the photometry pattern so as to minimize the influence of background level biases). These intensity readings are entered in a spreadsheet that has been prepared for this specific analysis procedure. A block of cells for each image is used to establish an extinction for that image in a way that produces reference star magnitudes that agree (on average) with those adopted in the first phase of analysis (taking into account the image's air mass). The zero-shift and extinction values allow for a conversion of the asteroid's intensity to be converted to a magnitude. Raoul Behrend has combined this data with measurements by Yassine Damerdji and the early data by VVR and BLG to produce a new period of 22.97 +/- 0.14 hours. The amplitude for the solution of the data in the previous figure (0.27 +/- 0.10 magnitude) is compatible with the 0.3 +/- ~0.05 magnitude amplitude given by Behrend using the combined data. The combined data calculated by Raoul Behrend can be found at Raoul Behrend's rotation light curves . The light curve solution at this site is likely to change as new observations are added to the analysis. Here's my version of Raoul Behrend's rotational light curve period of 1.2733 +/- 0.0026 days, fitted to the data available to me (VVR and BLG). Figure 4. Adopting Raoul Behrend'srotation period solution of 1.2733 days (30.6 hours) and allowing for zero-offset adjustemtns, it is possible to achieve an acceptable fit to the VVR and BLG observations.